← Single Card Tarot Reading – November 20, 2013. Single Card Tarot Reading – November 21, 2013. …Its the Page of Wands. 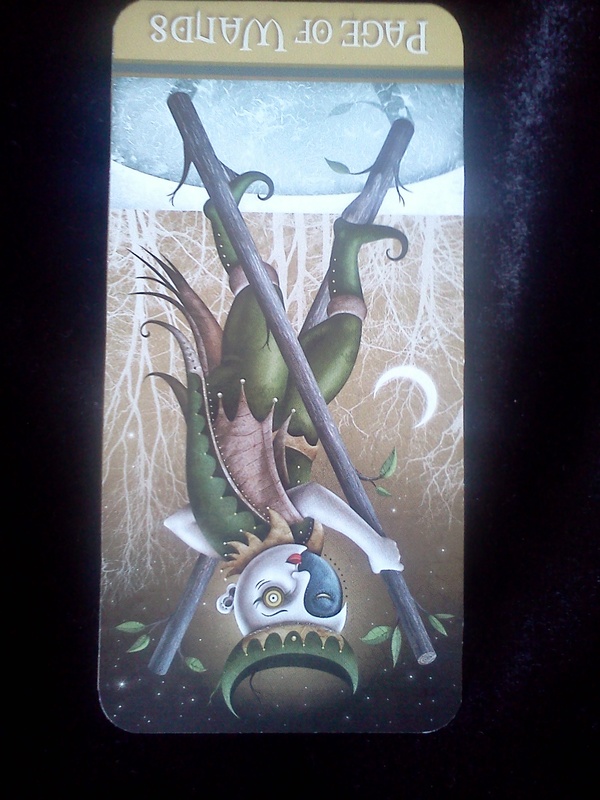 The Page of Wands upright is a person who is full of enthusiasm and spontaneity. They are adventurous, playful and full of Joie De Vivre (Joy of Life). The also have a fresh perspective and come up with creative ways of doing things. Here we see our Page using stilts to get across this pond, ingenuity at work. However, since the Page is reversed, we are asked to ponder his less desirable traits, in his shadow aspect the Page of Wands’ adventurousness and spontaneity becomes reckless. He is willful, stubborn and immature. You may see him throwing a temper tantrum if he doesn’t get his way. He can use his charisma to be manipulative and at his worst may represent a bully. Watch out for these energies today, whether you see them coming up in yourself or in others. Since these energies are immature this person will not be reasoned with or understand why their behavior is inappropriate. Don’t feed the beast with arguing, best to just ignore them if you can. If you notice these traits coming up in yourself it may be a good idea to meditate on why you feel compelled to behave in such a way. What do you get out of this type of behavior? Is there a need getting filled when you act this way that you could fill in a healthier manner? I hope everyone is having a great day. I will be back tomorrow with another single card tarot reading and I’m hoping to get another tarot spread posted soon, so stand by for that. Hi, I’ve just found your blog. You are the second one who is pointing out the possibilities of reversed cards.